Home » awesome duuuuuuude , food , peppers , what could possibly go wrong » Grow your own Bhut jolokia! 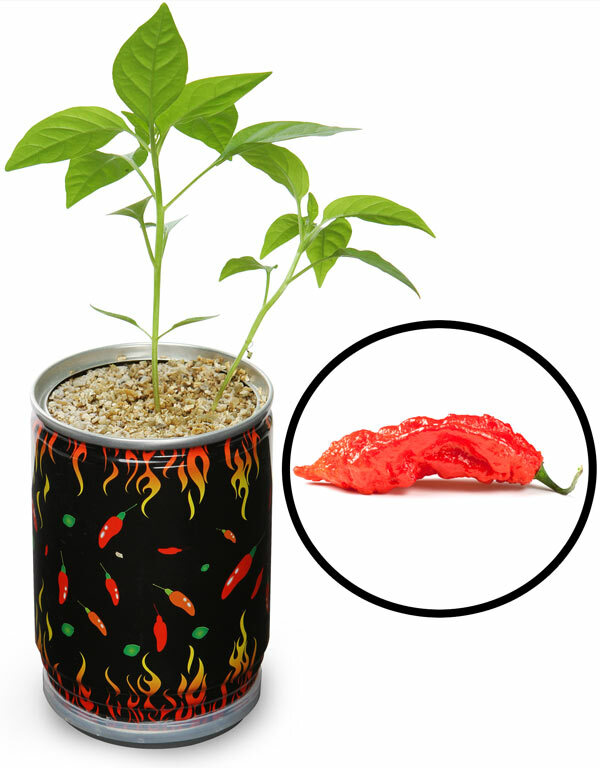 Grow your own Bhut jolokia! "Weird Ed" Woody, my filmmaking partner, is quietly attempting to murder me. That's the only reason why I can conceive of his sending me this link to ThinkGeek's product page for the Grow Your Own World's Hottest DIY Pepper kit... because Weird Ed is well aware of my fascination with spicy hot food and he knows that I'm not going to pass up on the chance to grow my own Bhut jolokia! This pepper, native to northeastern India, was written about more than three years ago on this blog and at the time some enterprising folks were looking at how to market it to the wider world. Well for a few bucks and some scratch you can get this pop-top can, open it up and give it water and sunlight, and in a few weeks you'll get your first sprouts. The pepper comes in at more than a million scorching Scoville units of heat. By comparison, your typical bottle of Tabasco sauce is 2,500 Scoville units. A few weeks ago the Bhut jolokia was dethroned as the hottest pepper on official record by a hybrid (which is based on the Bhut jolokia), but it's still the hottest-known naturally occurring pepper that's on the market.